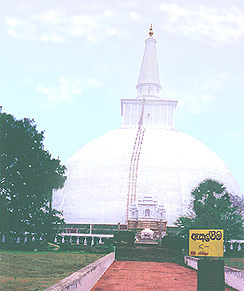 Thuparama stupa was originally the first Buddhist stupa constructed by King Devanam Piyathissa. 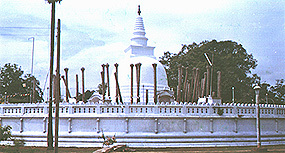 Many devoted monarchs of Anuradhapura period, improved the temple with precious fittings and additional constructions. During the 10th century, Chola invaders completely luted the temple. 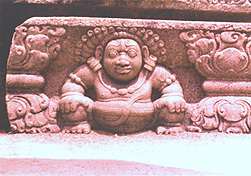 King Parakramabahu reconstructed the stupa at a later date. The Golden Sand stupa, 270 feet in height and diameter, is the largest of its kind in the world. This carving is found on the flight of steps at the pavilion entrance with the moonstone (shown below). Classic moonstone at queen's pavilion. 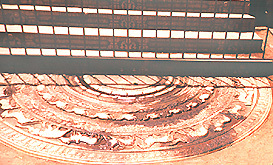 The outermost semi-circle is ornamented with flames. The next consists of elephants, horses, lions and bulls. The inner most semicircle is decorated with a lotus. (photographed after a rainy spell). Samadhi statue is world renowned for its artistic refinement in depicting the boundless compassion of Lord Buddha. picturesquely situated on a rocky hill. Section of Lake Thisa is in view. All the Pictures on this site include Copyright cards.